Looking for a quick way to jazz up short ribs? I was rummaging through our fridge a while back and found a container of half-unused miso. I quickly mixed in about two tablespoons of miso, two tablespoons of mirin, and some brown sugar to taste. I added in a couple dashes of hot sauce and this was ready to slather onto some short ribs. I let the short ribs marinate for a couple of hours just because we had the time. 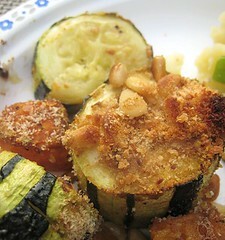 For sides, we made some roasted zucchini (with a bit of some other winter squash thrown in as well) that we topped with breadcrumbs and pinenuts. 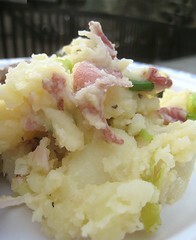 We also made some mashed/"smashed" potatoes. But, who would even look at the sides when you have such shortrib beauty around? 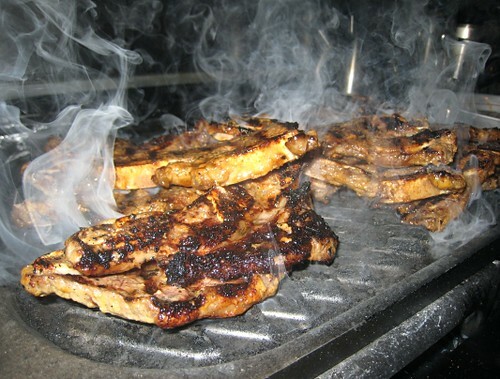 Look at them sizzle! This was during our "PG" period: PRE-GRILL, that is. So, I grilled the shortribs on a stovetop grill. I told you, shortrib beauty! 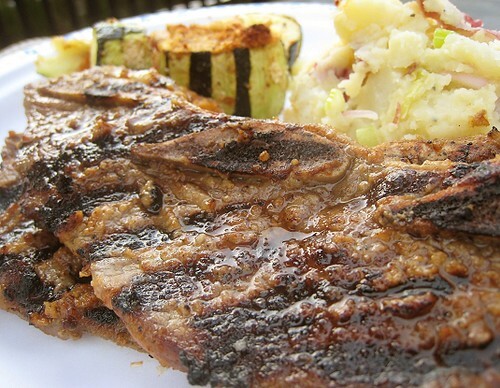 Miso shortribs with zucchini and smashed potatoes? I can't say I was disappointed with the meal at all. Mix together equal parts of miso and mirin. Add some brown sugar, to taste (to balance out the saltiness from the miso). If desired, mix in hot sauce or chili flakes for heat. Marinate the shortribs in the miso mixture for 2 hours or more. If pressed for time, simply coat the shortribs well with the mixture before cooking. Grill the shortribs until done. 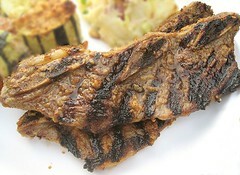 Oh miso short ribs sounds fantastic! great take on the traditional korean bbq! We have definitely got to give these a try - short ribs are a real favourite around here! Thanks! 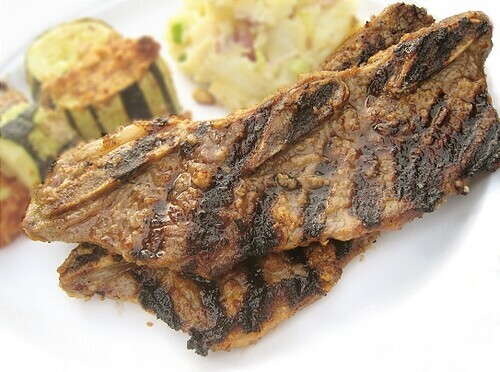 We discovered that we had actually already blogged about Miso Shortribs before! LOL.